Deepen your sense of the past at sights like El Barri Gòtic and Barcelona Cathedral. Get a sense of the local culture at Casa Batllo and Basilica of the Sagrada Familia. 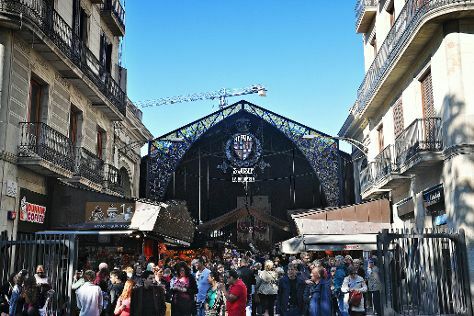 There's much more to do: pick up some local products at La Boqueria, tour the pleasant surroundings at Parc Guell, see the interesting displays at Carrer del Mirador del Palau Nacional, and get the lay of the land with Walking tours. To see photos, maps, ratings, and other tourist information, refer to the Barcelona trip itinerary builder site . Uberlandia, Brazil to Barcelona is an approximately 16-hour flight. You can also do a combination of bus and flight. Traveling from Uberlandia to Barcelona, you'll lose 4 hours due to the time zone difference. Traveling from Uberlandia in June, expect somewhat warmer with lows of 22°C in Barcelona. 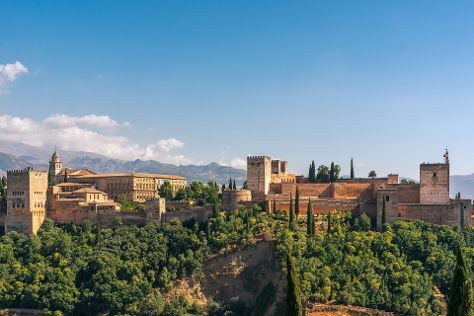 Finish your sightseeing early on the 9th (Sun) to allow enough time to travel to Granada. Kick off your visit on the 10th (Mon): take in the architecture and atmosphere at Basilica de San Juan de Dios, steep yourself in history at Generalife, take a stroll through Albayzin, contemplate in the serene atmosphere at Monasterio Cartuja, then get to know the fascinating history of Mirador de San Nicolas, and finally contemplate in the serene atmosphere at Cathedral and Royal Chapel. On the next day, admire the landmark architecture of Alhambra and then see the sky in a new way at Science Park (Parque de las Ciencias). For maps, where to stay, ratings, and more tourist information, read Granada road trip planning site . Traveling by flight from Barcelona to Granada takes 4.5 hours. Alternatively, you can do a combination of flight and train; or drive. When traveling from Barcelona in June, plan for a bit warmer days and a bit cooler nights in Granada: temperatures range from 35°C by day to 19°C at night. Cap off your sightseeing on the 11th (Tue) early enough to go by car to Malaga. On the 12th (Wed), pick up some local products at Mercado Central de Atarazanas, admire the masterpieces at Museo Picasso Malaga, steep yourself in history at Alcazaba, then take in the spiritual surroundings of Malaga Cathedral, and finally view the masterpieces at Art Gallery Gravura. To find traveler tips, other places to visit, photos, and tourist information, use the Malaga trip maker tool . Traveling by car from Granada to Malaga takes 1.5 hours. Alternatively, you can take a bus; or take a train. In June, daily temperatures in Malaga can reach 34°C, while at night they dip to 21°C. Finish your sightseeing early on the 12th (Wed) so you can take a bus to Seville. On the 13th (Thu), take in nature's colorful creations at Royal Alcázar of Seville, take in nature's colorful creations at Jardines de los Reales Alcazares, then delve into the distant past at Archaeological Ensemble of Italica, and finally admire the landmark architecture of Plaza de Espana. On the 14th (Fri), you'll have a packed day of sightseeing: get to know the fascinating history of Plaza del Triunfo, pause for some photo ops at Seville Cathedral, then admire the masterpieces at Las Duenas, and finally appreciate the extensive heritage of Barrio Santa Cruz. To find reviews, traveler tips, more things to do, and more tourist information, read Seville trip website . Getting from Malaga to Seville by bus takes about 2 hours. Other options: take a train; or drive. In June, daytime highs in Seville are 35°C, while nighttime lows are 20°C. Finish your sightseeing early on the 14th (Fri) so you can take a train to Madrid. The Walls of Avila and Royal Palace of Madrid are good opportunities to explore the local culture. Give yourself a bit of retail therapy at Mercado San Miguel and Mariano Zamorano Swords. Get out of town with these interesting Madrid side-trips: Segovia (Catedral de Segovia & Alcazar de Segovia), Cathedral of Avila (in Avila) and Toledo (Casco Historico de Toledo & Catedral Primada). And it doesn't end there: examine the collection at Prado National Museum, explore the world behind art at Museo Nacional Centro de Arte Reina Sofia, get a taste of the local shopping with Gran Via, and don't miss a visit to Plaza Mayor. For traveler tips, ratings, maps, and tourist information, read our Madrid trip itinerary planner . You can take a train from Seville to Madrid in 3 hours. Other options are to fly; or drive. In June, plan for daily highs up to 36°C, and evening lows to 19°C. Wrap up your sightseeing by early afternoon on the 18th (Tue) to allow time for travel back home.